Makenzies Miracle: Time to Relax! Makenzie got up about 8:00am and I noticed that her food bag was still full! She only got half of the food she was supposed to get! I am not sure what happened exactly but if I had to guess it started beeping and I turned if off while 98% asleep! Oops! That usually would not be the worst thing to happen but today was not the best day for it! She missed 4oz yesterday because of the trip back. On top of that travel is hard on her. I started her monig feed thinking about how much I could get into her today when she puked! I cleaned her up and not even 20 min later more! AHHHH! She got 8 oz in. I guess some is better then none! At this point I just start a drip of pedialite hoping that the vomiting was from being a bit dehydrated. She tolerated that great and there was no more vomit!! YEAH!! It is a bit after midnight and she seems to be doing just fine with her regular night feed! Sigh!! Pray that it stays that way!! We had a great day otherwise just hanging out! The boys got home about 11am! Makenzie was so excited to see them. They were so cute with her too!! I worked with her a bit on the bolster in the afternoon and she had a great time! I was able to get both of her hand completely open and weight bearing onto the edge with out any stretching or effort at all! AMAZING!! Then Kaleb came and sat on the bolster right in front of her so I picked up her hand and showed her how to push him off! She laughed so hard! He got back on and told her to push him off! She lifted her arm all the way up and put it on his back! I helped the rest of the way but she was so proud!!! I was so excited for her!! After the last 2 weeks it was so nice to relax!!! She is sleeping peacefully getting some rest for the week ahead.. back to life! LOL! Please continue to pray for those little cells in her! Pray that God would guide them to the places that will bring the most healing!!! Believe.... Prayer Works!!!!! Go, Makenzie! You show your brother who's boss! 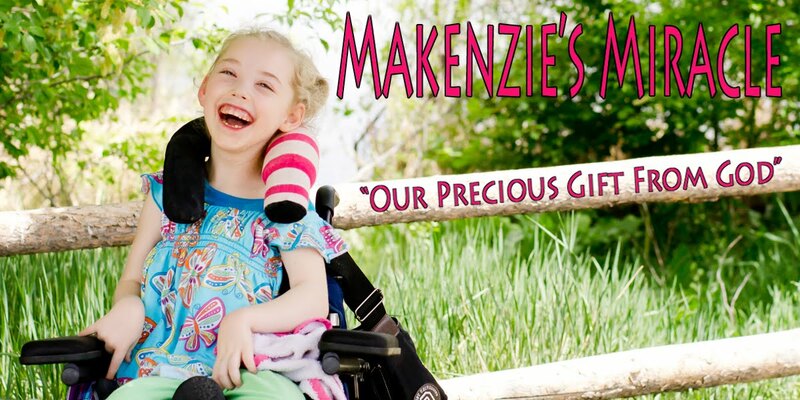 I'm so happy to hear about Mackenzie's progress. I will be praying for her, as I will for all of us. I love your blog site. Great job! Hi Pam, It's Laura in Costa Rica. We are still here, but leaving in a few days. I am ready to get home! So, so, so glad to hear that Makezie is doing well! We are definitely praying for her. Please visit our blog at www.cure4dad.blogspot.com. Take care and God Bless!! !